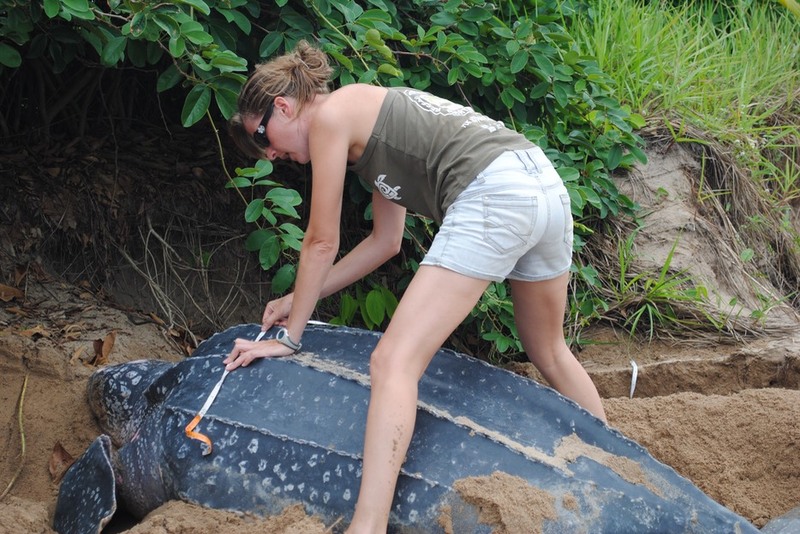 Where do olive ridley sea turtles go after nesting on the French Guiana beaches? 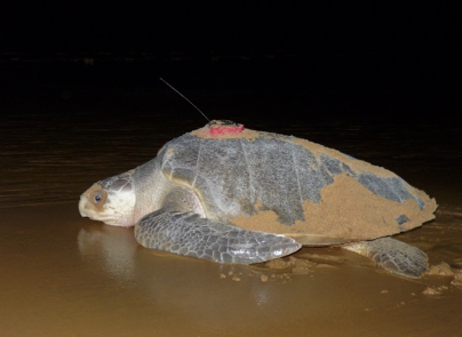 To describe the migration and diving behavior of the population of olive ridley sea turtles nesting in French Guiana, 18 females were satellite tracked using CTD-SRDL tags between 2013 and 2015. Results from this exciting study have just been published in Chambault et al. 2016, and are summarized below. The olive ridley Lepidochelys olivacea is the smallest of the seven sea turtles species in the world (on average 36 kg for 70 cm), classified as vulnerable by the International Union for Conservation of Nature and known to have a carnivorous diet, feeding either on crustaceans, cephalopods, jellyfish or even small fishes. Such preys can be found in highly dynamic ecosystems, such as the western part of the Equatorial Atlantic, on the Guiana basin. This productive area is under the influence of the Amazon River plume and is also shaped by strong oceanic currents, i.e. the North Brazil Current and the Equatorial Counter-Current that generate eddies. To identify where olive ridleys migrate and why they select particular areas during their migration, 18 females were equipped with satellite tags, to follow their displacements, as well as their diving behavior and the environment encountered. Therefore, the tags recorded the animal’s location, diving parameters (dive depth, dive duration, surface duration) and oceanographic data (temperature and salinity of the water). A female olive ridley returning to the sea after being fitted with a satellite tag. All the turtles performed a north-westward coastal migration (travelling on average 1502 km), by remaining in relatively shallow waters (between 20-100 m deep) stretching from French Guiana to the Venezuelan coast. They used distinct foraging areas (Fig. 2), some of them located in close proximity to the French Guiana nesting site. Figure 2: Trajectories of the 18 olive ridley’s equipped, while transiting (grey) and foraging (black). The red lines refer to 20 m and 100 m isobaths respectively. 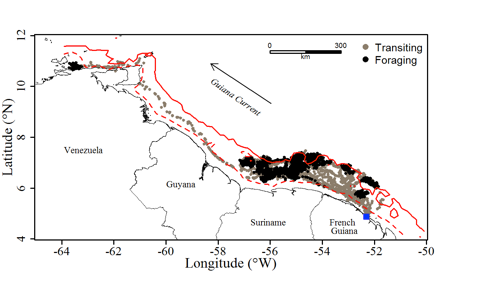 The turtles travelled in the same direction of the Guiana current, flowing north-westward, and therefore they likely saved energy during this energetically costly migration. By remaining close to the shore, the turtles tend to simultaneously avoid the turbulent eddies (highest SSH values, Fig. 3) that are generated by the currents, and also target areas were potential preys tend to aggregate (Fig. 4). 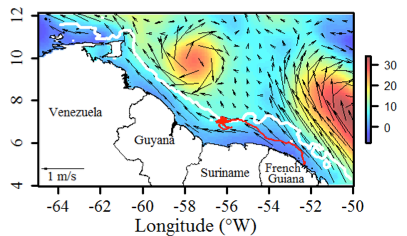 Figure 3: Map of the Sea Surface Height (in cm, to identify the eddies) and the currents over the Guiana Basin. The white line refers to 100 m bathymetry and the red line is the track of one individual. 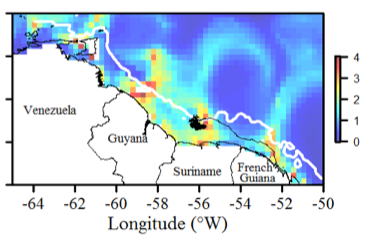 Figure 4: Map of the prey biomass (g.m²) over the Guiana Basin. The white line refers to 100 m bathymetry and the black line is the track of one individual. In total and for the 18 tracked turtles, the tags recorded 7400 dives. On average the turtles immersed during 46 min at 44 m deep (Fig. 5). Regarding the oceanographic data, 1196 CTD profiles were recorded, providing a wide range of salinity (from 7.3 to 36.3 psu) and temperature data (from 21.5 to 30.1 °C), due to the numerous rivers discharges along the Guiana coast. This study was the first to use such tags on olive ridley sea turtles, improving therefore our understanding on both the foraging behavior of this carnivorous species as well as the environment encountered, which is particularly fluctuating in this highly dynamic area. 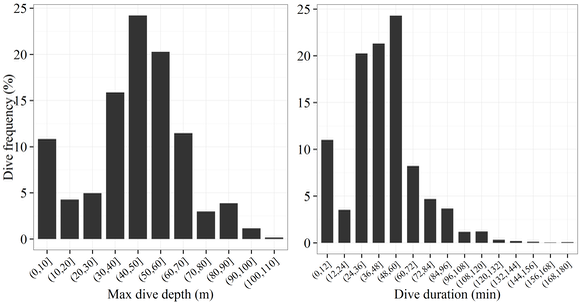 Figure 5: Histograms of the maximum dive depth and dive duration recorded by the tags.